This dramatic, sparkly dress will help you make an entrance at any event. The Cream and Gold Sequin High-Low Strapless Dress is fully lined for opacity and has cream chiffon overlay on top in a stunning high-low design. Miniature gold sequins at the bust add shimmer to this pretty look and an included chiffon fabric sash wraps around the waist and can be tied into a bow or left to hang. An exposed back zipper completes this dress. The Cream and Gold Sequin High-Low Strapless Dress would be perfect paired with neutral or gold strappy heels and a cute clutch purse. Details: Fully lined. Exposed back zipper. 60% silk, 40% polyester. Lining: 100% polyester. Hand wash cold water separately. Color will bleed. No bleach. Hang to dry. Small measurements: Length from top of bust to hemline: 26-46”. Bust: 32-34”. 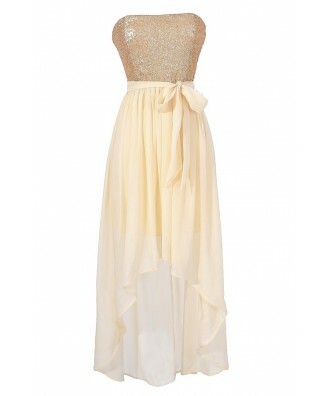 You have added Cream and Gold Sequin High Low Strapless Dress into Wishlist. 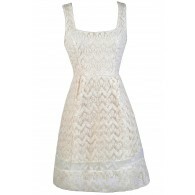 You have added Cream and Gold Sequin High Low Strapless Dress for Stock Notification. 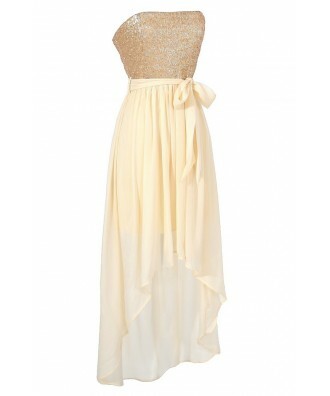 You have set Cream and Gold Sequin High Low Strapless Dress as a loved product. 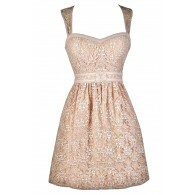 You have removed Cream and Gold Sequin High Low Strapless Dress as a loved product.